My girlfriend is such a lousy cook, help me please! There are many great restaurants in Zurich. Personal favourites are Italia and Da Michelangelo (both Italian cuisine), Ah-Hua and Lillys (Asian inspired) and Hiltl (Vegetarian). The Hiltl also has a nice lounge and transforms into a club at night. Read post from June 14 to find out where you can get a decent dinner without spending a fortune. Here you’ll find a list of nice garden restaurants. Yeahhh: Happy 721st birthday, Switzerland! Swiss people like the 1st of August mainly because they’re off work – time to relax and enjoy the sun. … stay in the city and enjoy the quiet summertime in one of Zurichs public baths or stroll around town. … enjoy an extensive brunch on a leisurely cruise on lake Zurich in the morning or book a table on the evening ferry with beautiful views on bonfires and fireworks. … take the train to Zurich Oberland and hike up Hörnli or Schnebelhorn. Bring your own Cervelat! … try a real swiss breakfast at one of the farms around town. Find more (german) information here. Make sure to book ahead! 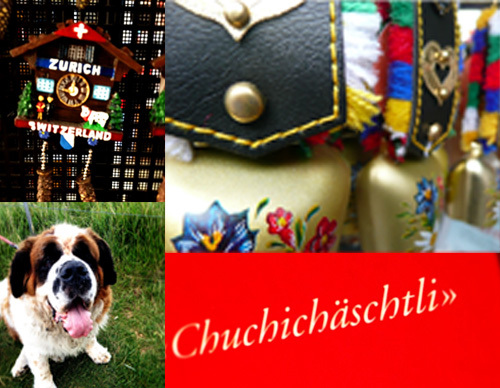 … attend the official National Day celebrations in Zurich. Download the program in english at the bottom of this page. … skip all these things and stay in bed. There is an Openair party going on at Allmend tonight! Oh and by the way: on the 1st of August we celebrate the Confederation of the 3 founding cantons Uri, Schwyz and Unterwalden in 1291: this was when the Eidgenossenschaft was born! I need rock’ n´roll, so put another dime in the jukebox, baby! Try Tuesday nights at club Mascotte. At Karaoke from Hell, the band hits the wild playlist and local heroes dare to enter the stage. Are you one of them?! For solid rock, strong drinks and a rockabilly feeling, go to Mata Hari Bar or Sansibar. At Kafi Dihei, you’ll feel like in your grannys livingroom and we promise: you’ll easily lose track of time. As the name already says („dihei“ means at home), the cosy interior, the wonderful homemade dishes and the friendly owners Geraldine Gschwend and Sabinska Binswanger make you feel instantly at home. 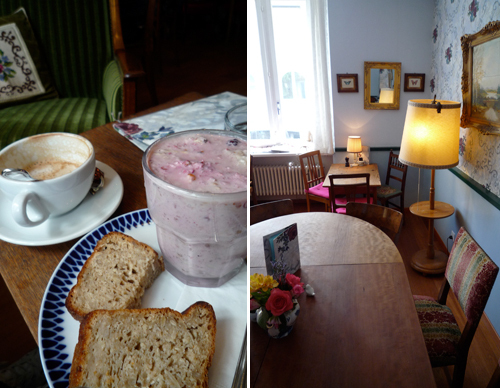 Thanks to the hint of lovely Kimandra, we enjoyed a lovely brunch at the place : granola, eggs and their homemade bread is just the best! BTW: The Kafi Dihei is perfectly located for a stroll trough the quarter of Kreis 3. Just opposite you’ll find the lovely store Bits and Bobs. If you turn left you’ll end up at Idaplatz with its many nice bars and coffee places and finally the thrift stores Berta 4 and Berta 6 are just around the corner too. I´m a little homesick. Where can I find my home away from home? At the delicatessen department of Globus you´ll find food from all over the world – there must be something typical from your country. Surely you´ll feel better soon after having eaten it! Or go to the bar at restaurant Volkshaus, sit in the large window and order a big piece of their famous chocolate cake – chocolate always helps! Want to know more about Swiss chocolate? Read post from June 28.